Taipei, Taiwan - 2-F No. 18-1 Lane 18 Nanjing W. Rd. What is a Hostel ???? only backpackers know that. Our aim is to help Backpackers to travel easily in Taiwan and we are also welcome to the budgets tourist for business trip, vacation, sightseeing, studying or staying..... You just have to respect one rule, please, leave your own rules at home and open your mind to enjoy the different customs, foods, peoples and lifestyle of Taipei. Provide you a great new experience, this is what this Hostel is made for. FREE Pick up service from Station. FREE Maps & Tourist & any Information what you need. FREE Internet Access with Computer & wireless. FREE Luggage Storage in Safe Lockable Rooms. FREE Cool owners with incomparable modesty ! We look forward for having you stay with us. HEY YO, we are the coolest hostel of Taiwan ! We have 2 bath boothes but in a Balcony, 2 toilets, a free landry machine with free washing powder. A small kitchen and a fredge there, and you can get free coffee or tea with filtered water or hot water. In the living room has a Cable TV with a DVD player and also free Internet access is available, and also you can use Wireless Lan. In each room has Air an conditioner, lockers are also prepared. We also have Airport pick up service, it costs 1, 000 NT dollers for1 to 4 people, 5 to 9 people is 1, 200 NT dollers. Take to the Airport costs 800 NT dollers for 1 to 4 people, 1, 100 NT dollers for 5 to 9 people. We have two building, for the most budget friends. Our Taiwanmex's places are small & simple, but have complete equipment to make you feel like at home. The first hostel is located on the 2nd Floor. It has Two beds dorm (bunk share rooms), two share bathrooms and the Airco , calm and peacefull cause the rooms do not have windows. The other one is located on the 3th Floor, one minute walk from the first building. It has Private Single room, Triple beds room, Four beds room and Six beds room with toilets. 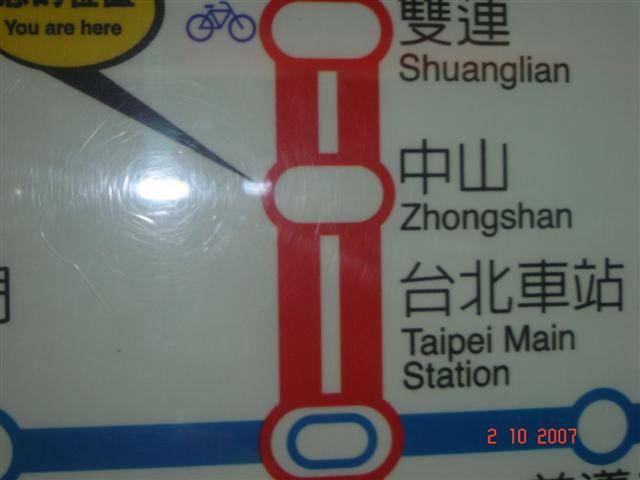 ZhongShan MRT Station on Red Line is only one stop from Taipei Main Station. 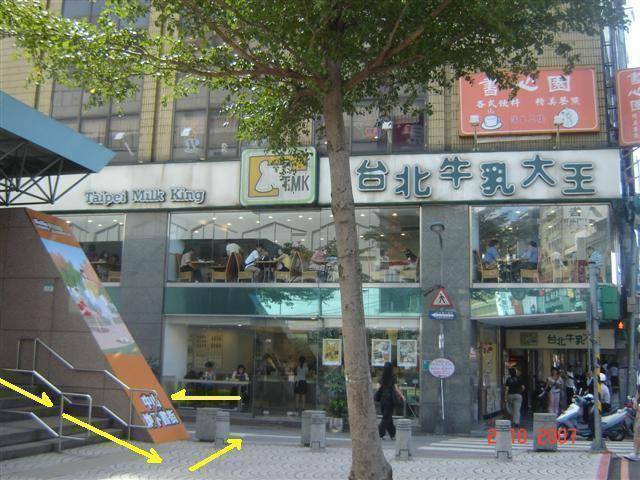 And by ZhongShan MRT station Exit 1 there is a restaurant named Taipei Milk King, and by opossit side has a Mitsukoshi Building. You should take the way to here is between those two buildings. DO NOT go across the big road there has traffic lights, and also DO NOT go along that big road busy with car traffics. JUST GO TO the way looks like a park, there are so many trees and a pedestrian street, we are along that way. We are located in the center of Taipei city. Stay 7 night will get 10% off. Payment : Pay when you arrive. advance,otherwise we will waiting you until midnight! So please at least call 886-938-073-528 and let we know you cannot come in.Thank you for your cooperation. 2-F No. 18-1 Lane 18 Nanjing W. Rd. After you leave the passport check. 1. Walk to the left to the bus desk. Buy a ticket to the Taipei Main Station. Cost is about 125 Taiwan Dollars or about 5 dollar U. S.
3. You stay on bus till the end or when it stops at the Taipei Main Station. When you arrive at Taipei Main Station please call us and we will meet you at Zhongshan MRT Station exit one and Bring you back to Taiwanmex. 4. Board the Subway going to ZhongShan EXIT NUMBER ONE. 5. Leave when you get to the ZhongShan Exit number one. You will see it written in English. 6. Leave the Exit one at your left side is Taipei Milk King and Look in front of you, there will be a Starbucks Coffee Shop. Look at it, then turn around 180 degrees or opposite and walk the opposite direction of Starbucks. 7. You are now on street NAMED: Lane 18 , Nanjing W. Rd, about 200s feet you can see Taiwanmex. 9. Ring bell for at gate, they will answer and ring you in. 10. Hostel is on the second floor. 1. From Airport to Taipei Main Station.